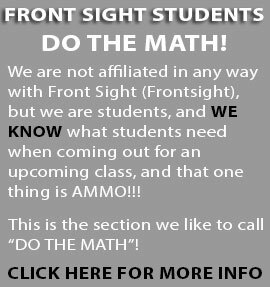 We are not affiliated in any way with Front Sight Firearms Training Institute, but we are students, and WE KNOW what students need when coming out for an upcoming class, and that one thing is AMMO!!! This is the section we like to call "DO THE MATH"! First, let’s rule out the onsite AMMO BUNKER for buying your ammo. A famous quote about the great showman, P.T. Barnum, “there is a sucker born every minute” comes to mind. If you are looking to spend a bunch more money than you have to, then by all means, shop there. If you want a great product, for a considerable discount, and great customer service, you are at the right place. OK, so you need ammo for an upcoming class and manage to find it online for a competitive price while sitting in your chair at home. Now you have got to figure out a way to get it to Pahrump, NV. You could bring it in with you if driving in, but who wants to explain to the cops who pulled you over for speeding or a broken tail light, why you have a truckload of guns and ammo for what they would consider enough to start a small revolution. You could fly it in with you, but most airlines have an 11# weight limit when checking ammunition. That's about 250 rounds of handgun ammo or 200 rounds of rifle ammo. Certainly not enough for a 4 day class anywhere, let alone Front Sight. OR like everyone else, you start thinking, "I'll just ship it." If you have ups pick it up at your house, that's an extra $20. If you live close enough to a drop off center, then you'll only have to pay the shipping, which will be in the ballpark of $30 or so. But who are you going to ship it to? Well, there are places, like the UPS shipping center in Pahrump, but they want $10 for every package they hold for you. 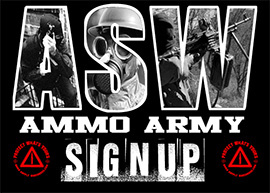 Even Front Sight’s preferred ammo vendor is NO LONGER offering drop shipping to them as a FREE SERVICE. They are charging $15 to have the ammo available for you to pick up at school. Seems everyone has their hand in your pocket these days. $80-100 on top of what you paid for your attractively priced ammo to be sent to you for use at class. Not so attractive anymore, is it? And more importantly, what do you do if your package was delayed and isn't there when you go to pick it up? That's right, you panic. Wouldn't it be better if you could just relax, browse our site, order what you need, and have Ammo Supply Warehouse hold your purchase right here for you to pick up when you fly in. GUARANTEED! NO WORRIES, NO HASSLES, NO PANIC! !